Right then. It’s midnight going into Thursday 12th September, and I’ve been on the go for the better part of 86 hours. Leaving the Gressoney life base, it’s reasonably flat and I’m moving at a determined jog towards Rifugio Alpenzu where I’m planning to get some sleep. My hamstring seems to have eased off and my feet still hurt, but that’s old news now. I’m feeling energised from the earlier stop, and march through relatively flat roads and through a town. 7km to Alpenzu, shouldn’t take long. I make good progress, even up the short, steep incline, and arrive at the refuge freezing and desperate for some shut-eye. I’m ushered to a dorm with one other person already in there. 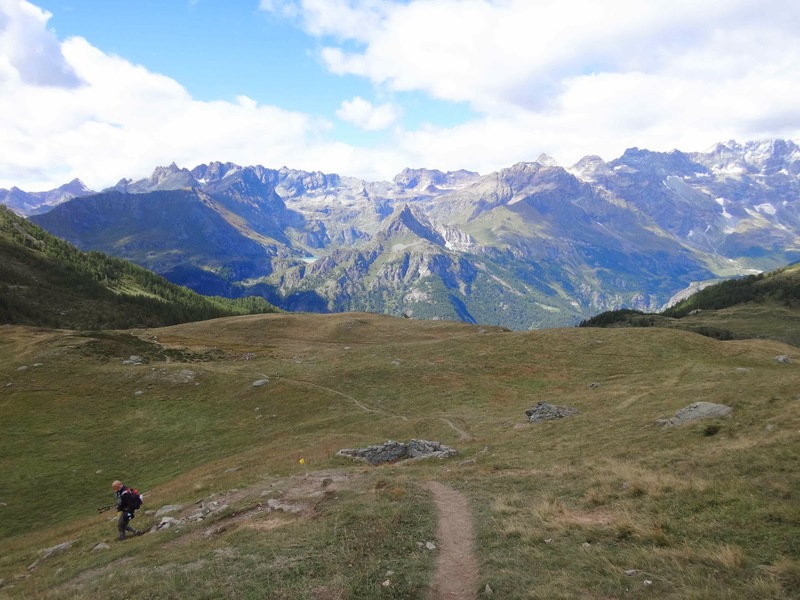 The man tells me that the cut-off at Gressoney was at 1am, and whilst I wanted to have 2 hours sleep, I may only be allowed 1 hour if the place fills up from the stragglers at Gressoney. Whatever. Just give me a bed please. WHAT?? My watch says it’s been an hour. I feel indignantly bereft, especially seeing no one new has entered the dorm since I got there. I haven’t got the energy to argue in a different language, so I trudge back downstairs in a grump. it’s nearly 3am. I see Barry and Shuwen downstairs, hunched over tables trying to sleep. I find a chair, pull down my buff and try to reclaim my lost sleep for another hour. Moving on, a quick stop at Rifugio Crest to refill and we’re off again. It’s 8.30am now and looking like it’s going to be a gorgeous day. 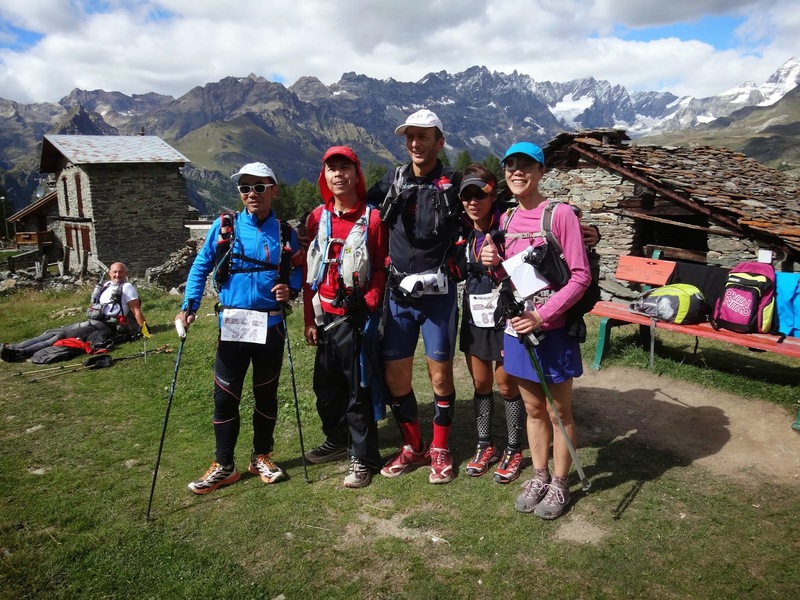 This time Makoto (the Japanese sherpa with the massive bag) and Miyuki, another Japanese runner, catch up to us before long. I’m feeling the fatigue and everyone else seems strong on the climbs, and even better on the descents. I’ve got Hoka envy again! Everyone powers on ahead and I’m trailing behind, getting grumpier as it gets hotter and they get further away. Grrr. My feet are super sore again too. I reach the time checkpoint at St Jacques at 10.37am. I faff around for too long taking layers off in preparation for the climb ahead. Somehow everyone catches up at the same time and we take an ‘Asia contingent’ photo for the record. And then we’re off again and somehow I’m one of the last to leave. 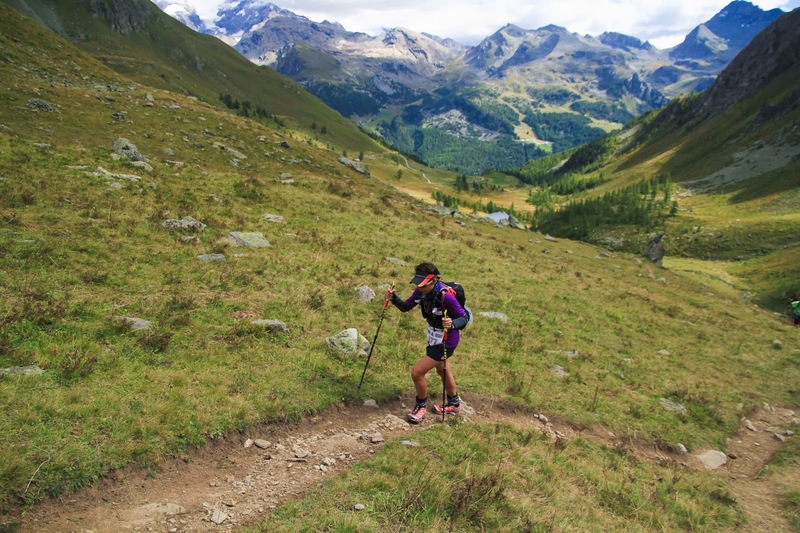 Emanuele catches up – he’d had an earlier pit-stop where his wife and friend met him along the descent with some supplies and a fresh pair of shoes (Emanuele now has Hokas!). 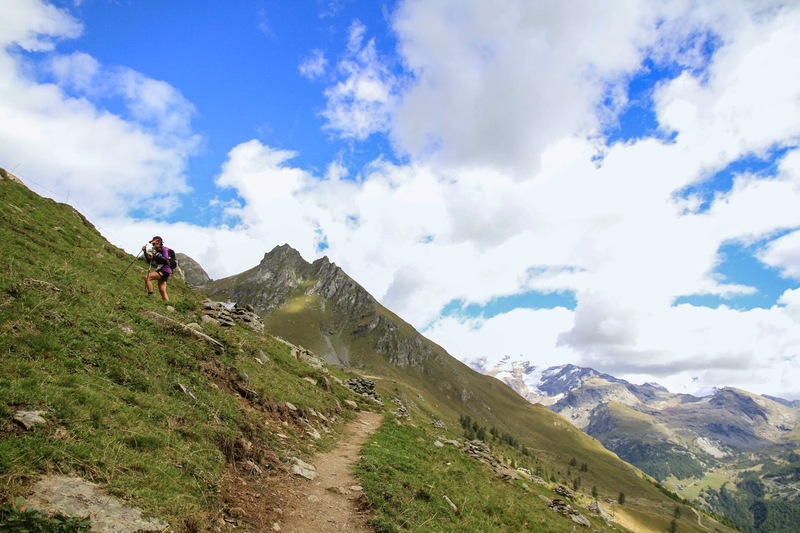 He tells me to try and stick with them – his wife and friend (ski instructor and strong climber) and hiking up to Grand Tournalin (2535m) with us and I do my best. They’re all wearing Hokas and I’m focusing on keeping pace with all three pairs of those damn marshmallow shoes. Not long after, I find my own pace and move ahead. 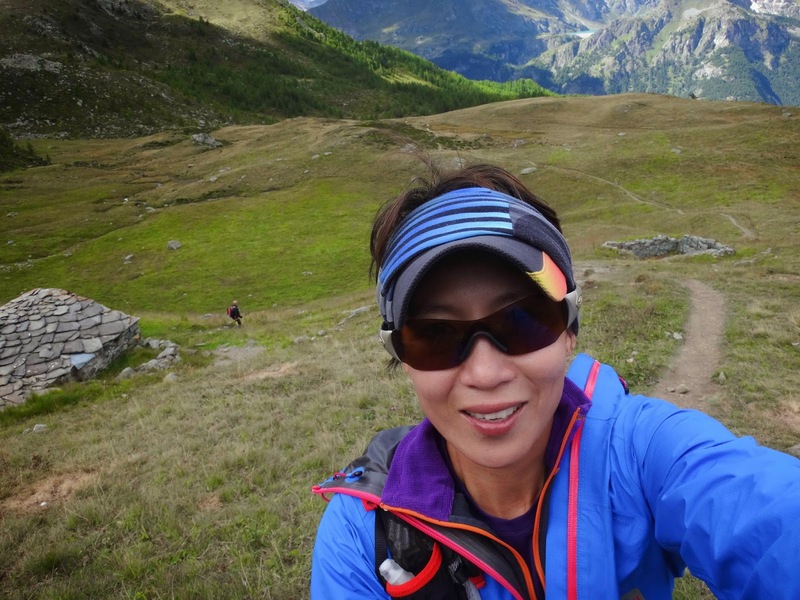 I meet Wang Bo, one of the Chinese photographers, on the way up and we reach the stop at Grand Tournalin together. There’s a young man outside the refuge ringing another massive set of bells – I didn’t get a picture because I was freezing and just wanted to get inside out of the cold. There’s a table of Japanese and a table of Chinese runners, then Emanuele and his supporters turn up as well. We’re all tucking in to the spread that’s laid out, and the fresh fruit salad here is a welcome change to all the bars and salami I’ve had so far. Fed, watered and warm everyone heads out and I’m a little behind trying to get more wam clothes on. 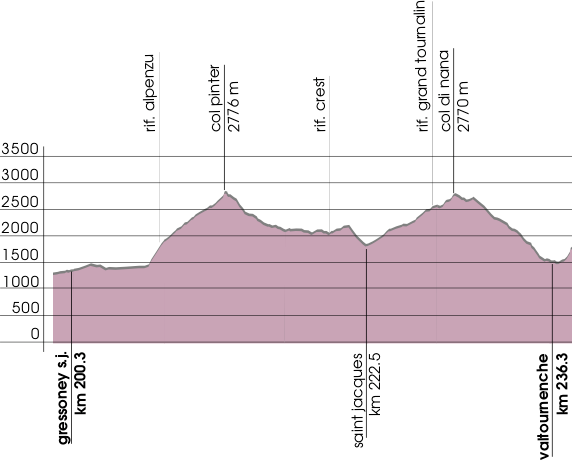 There’s a bit more climbing to Col di Nana (2770m) (saying that makes me giggle everytime! 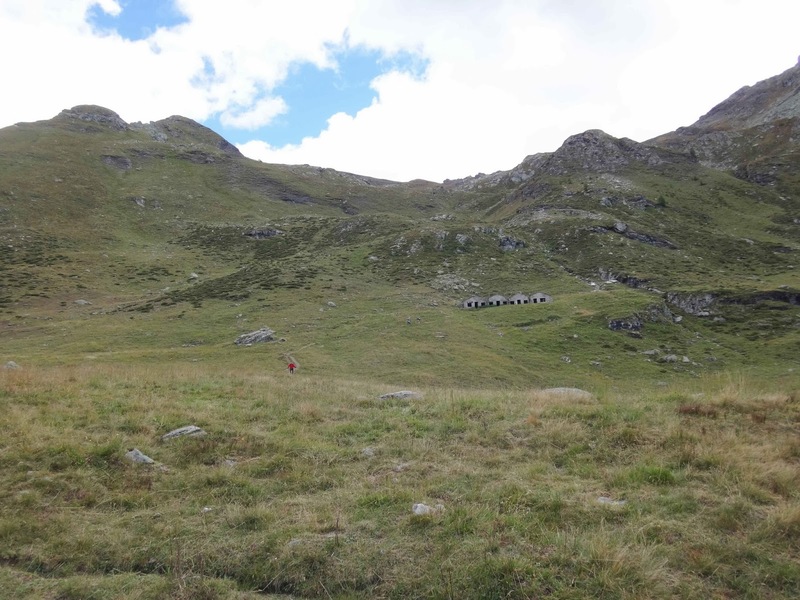 ), a smaller climb to Col des Fontaines and then downhill to Valtournenche, the next life base. About 6km, which is a very welcome thought. 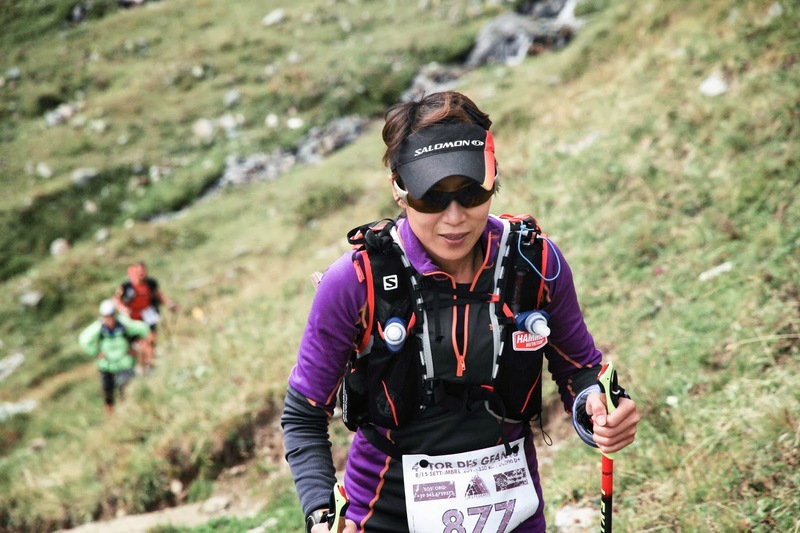 I’m fired up after the rest at Grand Tournalin, and want to catch the Asian runners ahead. I’m climbing like a mountain goat on a mission, well, that’s what I felt it was like .. in reality it probably looked like granny’s day out. But still. I felt good, and I was passing everyone in sight. Yay! Once at the top, I started jogging down and then decided to let fly. 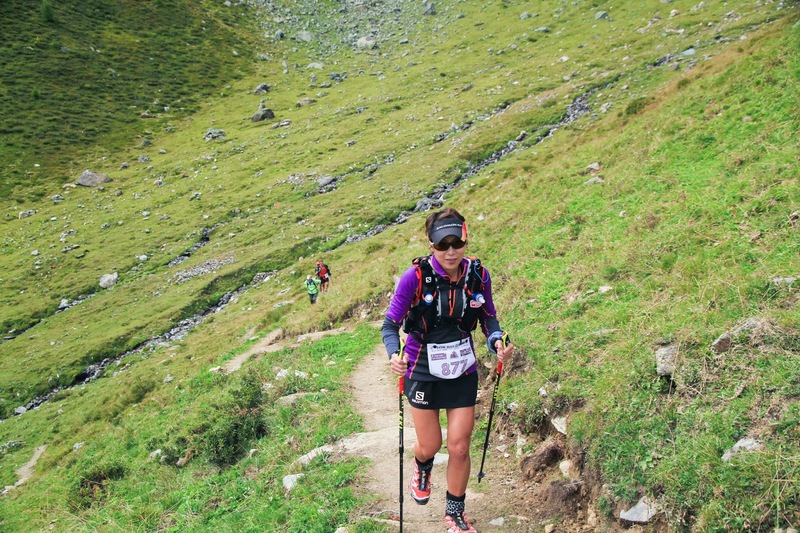 I must’ve had too much coke at Grand Tournalin because I was giggling like a pixie and running the descent like it was the finish line ahead. By now I’ve passed another 6 or so people including all the Asian runners, some of whom tell me to be careful, others try to follow. It feels so good to get some speed on, I’m flying over rocks and trail, only half aware that it could go very wrong if I had a mis-step. As the descent evened out, I stopped to take some pictures and savour the moment. It was nice to feel like I could cruise for a bit, my brain has been working overtime since we started. 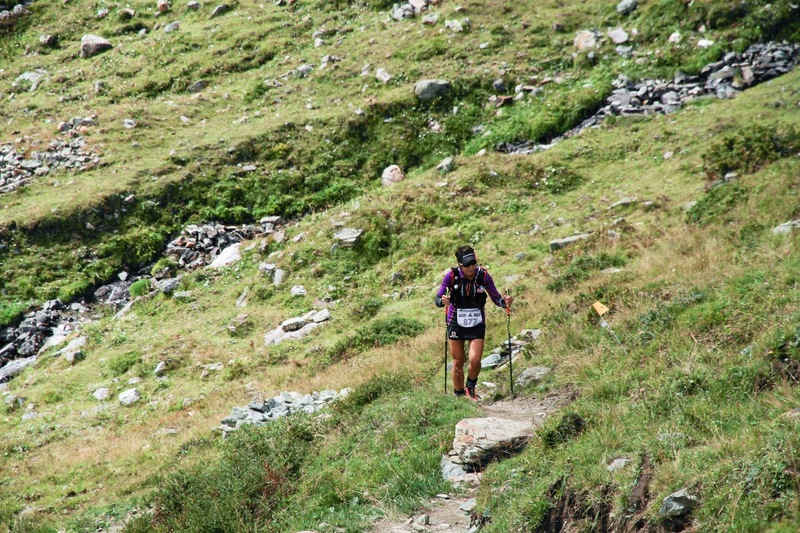 And very grateful to my poles for keeping me upright all this way. I’m in really good spirits now and eat a pile of food while Steve refills my pack with water, crisps, Snickers and batteries. He’s even dried off my wet clothes (I’d washed them at Donnas) and so I have clean clothes!! (Note to self – it’s a good idea to bring lots of spares .. two tops isn’t going to last a 6-day race) I wander off to have a shower in the sports hall behind, and decide to get my feet re-taped. I’m seen to by both the doctor and the podiatrist, who roll their eyes and do their best. I get sent on my way nearly an hour later with blisters drained, taped feet, and my extra special ice-pack knee pads. I get back to Steve who’s now chilling with a beer (envious!) and try to get my act together to head out. To my credit, I only take 2h 20 mins this time to get out of the life base .. not fast but better than before! The sun’s still shining, it’s a 5km climb to Rifugio Barmasse, and I’m feeling good. I leave valtournenche at 5.45pm, guessing it’ll take me 2 hours to get to Barmasse, maybe a good time for a quick kip if it’s dark. Onward!